I have some high standards for how marketing and sales at our company are going to not only interact with each other, but actually harmonize with each other and make each other better — it just means my KPIs and status reports are a little less cut and dry than your typical (and separate) sales team and marketing team. I’ve written before about inbound marketing — how buyers have changed. How authentic thought leadership today is more important than ever before. And, how the potential customer on the end of the phone line has expectations for that salesperson (SDR/BDR and Account Executive, alike) that far exceed anything else we’ve experienced. So when I first began formulating the role my very first business development representative (BDR) would play in my inbound engine, I was obsessed with taking what has been largely employed as a prospecting role and making it work within an inbound marketing environment. It’s been one very quick month since our brand new BDR joined our team, and in a short period of time we’ve already seen how he has not only supported our inbound marketing efforts, but has helped build a bridge for the customer’s journey from content-consuming prospect to active opportunity. And it’s been one month. You see, inbound marketing is great — I’m a huge advocate — but it’s even better when it leads to inbound sales. You might be thinking, they’re the same thing, right? And they are very similar in that you support a prospect through three stages of awareness, consideration and decision. But an inbound sales professional has the responsibility of identifying, connecting, exploring and advising those prospects all throughout their journey. 1) Inbound sales teams base their entire sales strategy on the buyer rather than the seller. 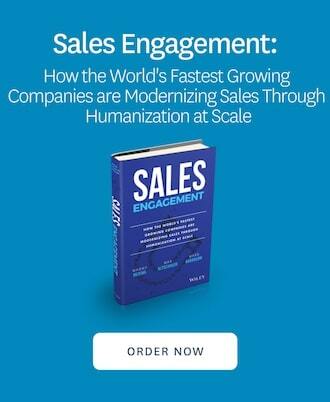 2) Inbound salespeople personalize the entire sales experience to the buyer’s context. One of the first things I had our new BDR do was study our buyer personas, the semi-fictional representations of the men and women he will be courting and serving for as long as he works at our company. Side note about buyer personas — they’re not just for marketing (or sales). They’re also an important resource for any customer success or product team. After all, they’re representations of the people who become your customers and use your product. Next, I had him consume nearly every ounce of content we had ever created. Most importantly, I planned for him to connect with our marketing qualified leads (MQLs), many of which had downloaded content from our library of ebooks. And, beyond simply reading those ebooks, I asked him to consider the pains, desires, goals and concerns that each of our buyer personas would have while reading each ebook. He then formulated anywhere from two to five questions for each persona for each ebook. By this time, not only was he feeling comfortable with our story and the problems we solved for our customers, but he was able to identify and speak to the pains that each buyer persona (we have three) would be bringing to his or her experience reading our content. What do you think happened when he began calling the MQLs to discuss the ebooks they had read? Rather than the dialogue being generic or unilateral, our new BDR is equipped to personalize those calls to the buyer’s context. Honestly, whenever I overhear his conversations with these leads, it’s a bit reminiscent of a book club. I find myself listening in on an authentic conversation between two people who both seem to understand a problem and are working together to uncover a solution. Now, this is still sales. At the end of the day, he has a quota to hit — and those are sales qualified appointments. If the MQL he’s working with is ready to move to the next stage of the process, then what usually comes next is either a deeper discovery meeting or perhaps a demo with an account executive (depending on how far the conversation went on this initial call). What’s most important is that this strategy is based not on the seller (in this case our BDR and AE) but on the buyer. Our inbound BDR has been able to add tremendous value to the journeys of our prospects, beyond the information we can provide them via marketing. The result of this is a more personalized product demo, a shortened sales cycle, and the ability for the account executive to focus on helping serve the unique needs of each of our buyers. As Vice President of Sales and Marketing, Jen Spencer leads SmartBug's sales, marketing, and brand strategy. Over her career, Jen has built several demand generation and sales enablement programs from the ground up and has experience working within tech startups, publicly traded companies, mid-market organizations, and the not-for-profit space. Jen subscribes to the notion that “we’re all in this together,” and great communication leads to great partnership. She loves animals, technology, the arts, and really good Scotch.